This is the view from the front porch at my friend Amber's house. She lives a little outside of town and has a beautiful home place, just big enough for plenty of privacy and plenty of horses. She and I taught down the hall from each other for about twelve years. Not too long ago, she changed schools to shorten her drive and to be a little closer to her neck of the woods. Amber is a believer in doing what makes you happy and following your dreams. And boy, does she have the gift of encouragement. Her students adore her. I sent her a quick text to tell her I stepped way out of my comfort zone and started my blog. Of course she was thrilled for me. In our exchange, I learned Oren Layne Designs (local decorators) had recently updated some rooms in her house. And just like that, she and her husband Tyler became Inspiration House #3. Cindy Jensen and Rhoda Vaughn are the owners of Oren Layne Designs. They've been decorating for awhile, but they've only been doing it together for about two years. They've done a bit of everything. They started redoing cabinets and moved to painting furniture. Lately they've been doing less cabinet work and more updating and decorating for clients. This is one of the two new chairs in the living room - the pillow is my favorite. The room is neutral and fresh. When it's time to change up the space, simply adding some color with accessories is all it will take. The sofa table, mantle, and unique picture frames in the next three pictures were made by a teenager learning to woodwork to raise money for a mission trip. They are beautifully created - nothing amateur about them. The round coffee table is a nice break from the ordinary rectangle. The brick and the built-ins were painted with Annie Sloan Chalk Paint in French linen. The other room updating and changing is Amber and Tyler's guest room. The furniture in the room belonged to Amber's grandmother - made somewhere around 1950. 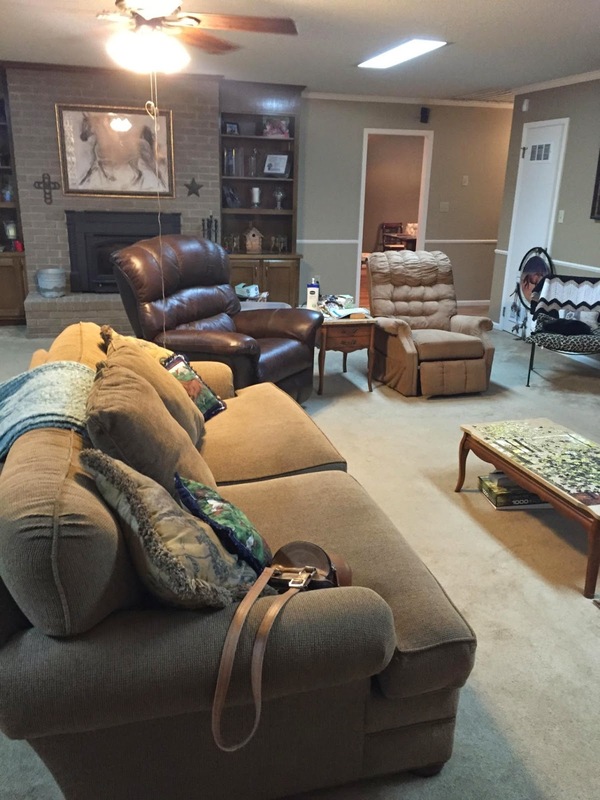 Cindy and Rhoda gave the furniture a make-over using Annie Sloan Chalk Paint in country gray. Thanks to my friends Amber and Tyler for having me. I hope you gathered a little inspiration for your own home place from this special place. You can see more of Oren Layne's work on Facebook. Follow them on Instagram @orenlaynedesigns. Their contact number is 205-799-6911. It was really nice to spend time with them, and hopefully, we'll have the chance to collaborate again! Have you used Chalk Paint to change anything at your house? Click on comments below and tell us how your project turned out. Or send us a picture to woodbanklane@gmail.com. Don't forget you can follow us on Instagram @woodbanklane. happy for them. The the County Setting for their home is perfect for Amber to enjoy her horses. Wow! I am so impressed. I never dreamed Amber was the type to hire a decorator, but they totally captured her spirit... not too fancy and very tasteful. I can't wait to see it for myself (hint, hint).